ULTIMATE Outdoorsmen Dream Property! Hunt bear, deer, turkey, and small game; the Bloody Skillet ATV trail as well as the Two Rock Run with Native Brook Trout for the catching. Just past the dirt bike/atv track, Sproul State Forest borders the property to the west. With a 1440 sq ft, 2 bedroom camp that sleeps 8, and is totally furnished right down to the cutlery, this camp enables you to experience nature at her finest and make yourself at home! 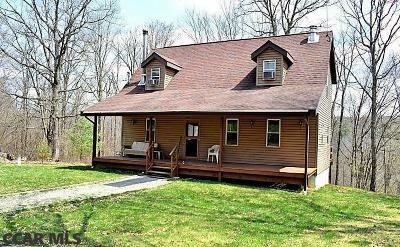 Take your coffee in the morning on the back deck to watch the sunrise, then hike, ride the trails, hunt and fish all day; only to come home to a warm fire in the living room or relax with the scenic view from the covered front porch. This camp has it ALL! 10' x 16' outdoor shed, Owner has rented camp on VBRO and Airbnb for great income options as well.